Cinemablographer: The Boys Are Back! The boys from Canada’s favourite sitcom are back! The Trailer Park Boys return in Trailer Park Boys: Don’t Legalize It and they take their dope-slinging, cuss-laden tomfoolery all the way to Parliament Hill. Don’t Legalize It offers a ridiculous premise for the satirical gang as it puts Ricky (Rob Wells) on a road-trip to protest the impending legalization of marijuana, which threatens his profitable white trash business. Julian (John Paul Tremblay) hires the car with drink in tow, as he needs a ride and a mule to bring his piss-smuggling product all the way from Halifax to Montreal. Bubbles (Mike Smith) goes along for the ride to Ottawa when he learns that his recently deceased parents left him some property in the swanky oasis of Kingston, Ontario. 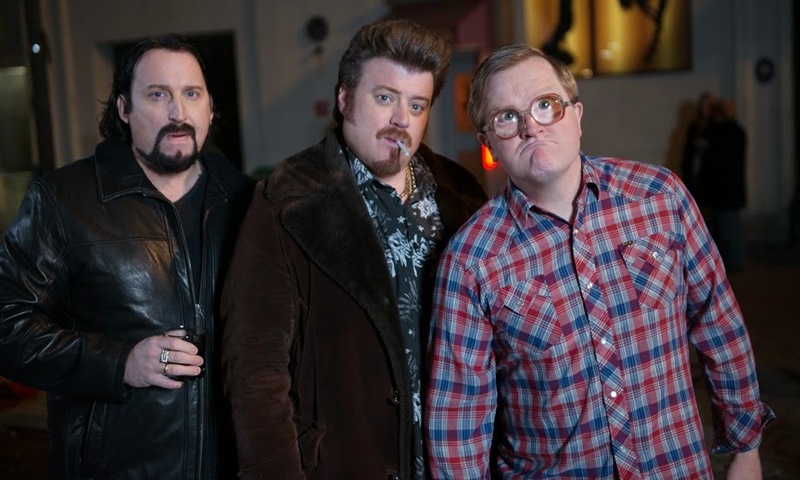 The Trailer Park Boys are back for a laugh-a-minute riot. One doesn’t need to be a fan of the Trailer Park Boys television series to enjoy Don’t Legalize It, but it probably helps. The film picks up virtually at the point at which the previous film (or season of television) left off. (As someone who’s seen only the odd episode, I can’t really tell which one.) Don’t Legalize It offers little in terms of exposition or introduction to the colourful characters that populate the trailer park, but these loony fools are simple enough to get a handle on without much pre-screening familiarity. The boys are utter buffoons—as are the other members of the trailer park peanut gallery like the creepy Mr. Lahey (John Dunsworth, who steals the show) and his boytoy Randy (Patrick Roach)—and the gang offers more of their gags that can be characterized only as coarse, outrageous, low-brow, and, above all, funny. Alternatively, the hilarious villainy of Mr. Lahey gives Don’t Legalize It a funny underlying commentary about the futility of demonizing marijuana use when alcohol provides a far more lethal weapon as Lahey makes Don’t Legalize It a booze-fuelled car chase as he gets tanked on the drive from Halifax to Ottawa. It's also a hoot to see Lahey throw a few boozy punches on Sparks Street after the boys join the rally at Parliament Hill! The irreverence of the Trailer Park Boys seems a bit timelier in Don't Legalize It than it did in previous installments (although I say this with relative ignorance to the series) as the boys bring their 420 shenanigans to the National Capital. Medical marijuana is a Canadian headline more than ever before, and the exposure and gradual openness to the subject are making some Average Joes a bit more open-minded to the ganja. (The popularity of The Trailer Park Boys probably has a hand in pot's rise in cultural mythology, too.) As Ricky and company make their plight a political affair and argue that it's their right to sell pot on the sly, Don't Legalize It takes an ironically tongue-in-cheek step with the fight against contemporary capitalism. It's a fight of the little guys against Big Business—embodied by the Maple Leaf in this case—and a hilarious take on the recent potest movements in which the rallying cry for the powerless is just one big puff of weed smoke. While Don’t Legalize It is surprisingly funny, the humour of movie, much like the show, might not translate well outside the Great White North. It’s simple Tim Horton’s-style humour with a sense of place and character to which Canuck audiences can surely relate. White trash humour knows no borders, though, so the silly satire of Don’t Legalize It should please anyone in search of chuckle-inducing R-rated humour. Canada’s own Three Stooges are back with Don’t Legalize It and the Trailer Park Boys seem to be a one-note joke that just keeps on truckin’. The Trailer Park Boys: Don’t Legalize It opens in theatres April 18. What did you think of Don't Legalize It? April 29 is Canadian Film Day! I Want Seconds of 'The Lunchbox'! "To Each His Own Beckett"
If Only Wally Had Shot the Film Himself!